Transnomis Road Information Exchange offers a path forward to a complete collection of road closures, obstructions, restrictions, conditions, incidents, and events – for all travellers. The Exchange offers municipalities, provincial agencies, railways, and others an efficient path for distributing their road information to navigation applications, emergency responder applications, provincial agencies and others from their road information management system (e.g. in-house GIS application). In exchange, the Exchange offers clients the opportunity to consume road information into their system for their use, e.g. from other municipalities on their borders, or within their region. The Exchange offers the distribution and shared information benefits of the Transnomis Municipal511 service, for those who prefer in-house and third party road information management applications. 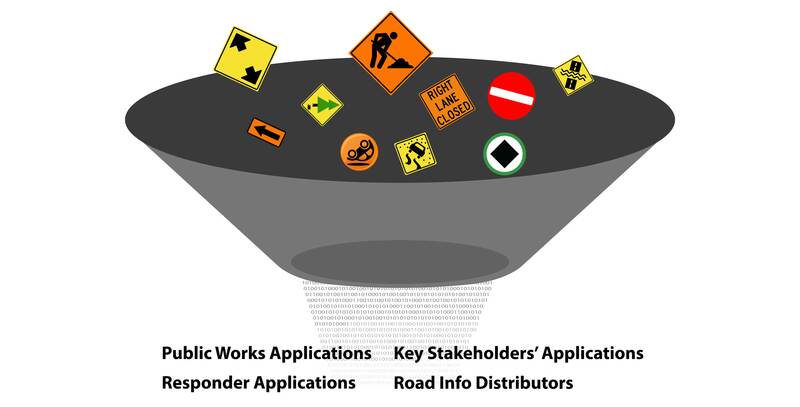 It is not practical for navigation solutions, responder applications, provincial agencies and other stakeholders to consume information from each roads department, in the many formats data is currently managed and shared. The Exchange bridges the technical gap, to the benefit of information sources and distributors. Transnomis appreciates good governance is required for province wide initiatives. In Ontario, Transnomis is working with the Ontario Good Roads Association (OGRA) to establish a multi-sector governance committee for the Ontario Road Information Exchange. Transnomis Municipal511 clients already receive the benefits of the Exchange. The Exchange addresses interest from stakeholders that have road information management tools in place. It is not practical for each navigation company, responder application vendor, provincial agency, etc. to consume road data from each municipality. The Exchange addresses the needs of the distributors, as well as those with road information to share. The more complete the collection of road information, the better the outcomes expected. The Exchange is well suited for province/state/country wide initiatives. The Exchange is open to railways, provincial agencies, private ferry and bridge managers, etc. The Exchange is priced by population to municipalities. Other pricing models are used with other stakeholders, e.g. railways. The Exchange can consume a variety of data formats, including the Transnomis API. This advanced API goes beyond many data formats, supporting issue type, impact indicator (e.g. Road Closed – No Emergency Access), detour route, and sections of road open to local traffic only. The data is shared in the Transnomis XML feed format, navigation vendor formats, and custom formats.